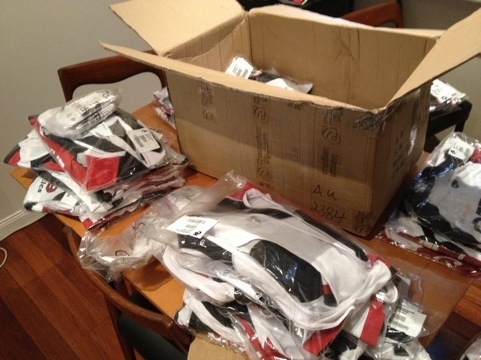 The latest batch of Cobra9 kit has arrived and been distributed. Looking forward to seeing the updated design out and about on the bike. This batch, like all of our kit is Champion Systems product and I am happy to say that there have been improvements on a number of fronts. The new version of these bibs moves the annoying seam from the top of your shoulder, so that it doesn’t rub anymore. The bibs are also cut higher which prevents the exposed belly button look which I was prone to as a taller rider, when standing upright with a shorter race cut jersey on. The new race cut jersey has longer arms which is a great improvement over the previous design. Nothing worse than being mistaken for someone in a sleeveless jersey. The improvement over our previous batch of socks is marked with the double elastic in the cuff making a massive difference. We were seriously considering switching suppliers in this area but Champion Systems have picked up their act in this area. Very impressed with these so far. The material is smooth and comfortable and the fit is very snug.